The Dwarf Orange Bulborb (テンコチャッピー?, lit. : "Child Dotted Chappy") is an enemy in Pikmin 2 and Pikmin 3. It mimics the Orange Bulborb and has the same edginess, noticing Pikmin at a greater distance than other Dwarf Bulborbs. It can still be easily defeated by swarming or using the simple methods of defeating Dwarf Bulborbs. To do: Confirm if the "seperate" typo exists on the guide. "Found in underground areas only, Dwarf Orange Bulborbs are little eating machines, and they're never far from an orange Bulborb. If you can seperate the creatures, you can swarm them or stomp them fairly easily-but if you have to take them on in groups, you'll be in for quite a battle." "Dwarf Orange Bulborbs aren’t nearly as durable as their as their fully grown counterparts. Toss a single Pikmin onto a Dwarf Bulborb’s back to quickly defeat this enemy." If a lot of Pikmin are available, swarm it and it should die before eating any Pikmin. Alternatively, aim and throw a bunch of Pikmin at its back. If one lands directly on it, it'll die right away. Purple Pikmin are especially useful for this technique, because they tend to home in on targets. In Pikmin 3, because of the lock-on mechanic, you can keep a moderate distance, wait until the enemy is idling in place, lock-on, and throw a single Pikmin for an easy kill. Run around it and swat it until it's dead, avoiding its attacks. See more: Breadbug family#Naming and Orange Bulborb#Naming. Much like the Dwarf Red Bulborb, this enemy is called a dwarf because it is a smaller-sized mimic of the Orange Bulborb. In Japan, it is called テンコチャッピー?, which translates to "Child Dotted Chappy", with Chappy being the Japanese name for Bulborb – this is not quite the same as the Japanese name for the Orange Bulborb with "Child" prefixed, as the larger enemy is called テンテンチャッピー?. Its scientific name is Pansarus pseudooculii orangium. Pansarus pseudooculli is the species name for most Bulborb mimics, and orangium is similar to the English word orange. Internally, this enemy is called bluekochappy in Pikmin 2, which is a combination of "blue", given how they were initially blue, and "ko chappy", a Romanization of part of its Japanese name. 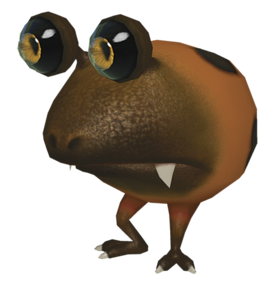 In Pikmin 3, it is internally paired up with the Dwarf Red Bulborb (kochappy), but is disambiguated as tenko, which is also a part of its Japanese name. German Orangefarbener Zwerg-Punktkäfer Written "Orangefarbener Zwerg-Punktk." in-game. The creature's corpse in Pikmin 3. Artwork of 3 Dwarf Orange Bulborbs. Artwork of 3 of the creatures and an Orange Bulborb. Two of the creatures in the Piklopedia. Some more of the creatures. The creature's e-card, #06 (3rd blue card). Dwarf Orange Bulborbs surrounding an Orange Bulborb. Frontal view of the creature. Like the other Bulborb-mimicking Breadbugs, if this creature is petrified in the Piklopedia, when it breaks out of the stone it runs around eating any thrown Pikpik carrots at a much greater speed than normal. This page was last edited on March 31, 2019, at 19:02.